Members of Roman Catholic High School’s World Affairs Club participated in an event last month at Temple University’s Fox School of Business. Student members of Roman Catholic High School’s World Affairs Club joined other high school students from Philadelphia, Pittsburgh and around the world last month in the third annual International Student Summit at Temple University’s Fox School of Business in Philadelphia. The summit simulated an international conference on nuclear security convened by the International Atomic Energy Agency. 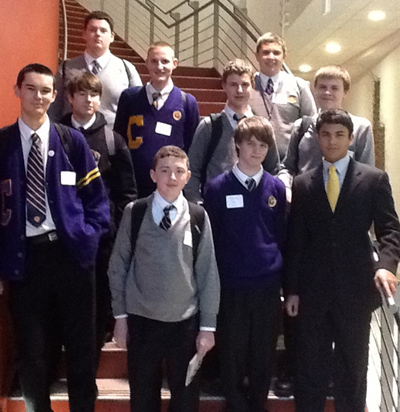 Roman Catholic student delegates included Logan Moore, William Masgai, Tyler Pizzo, Peter Scharf, Stephen Waters, Connor Kain, Tyler Brady, Edward Dunbar, Francis McLaverty and Ivan Soltero. The delegates represented 10 different countries in the roles of senior government officials, including high-level military leaders and senior diplomats, from both established nuclear powers and potential nuclear weapons states. Delegates were charged with strengthening an international framework to secure, to the fullest extent, all existing nuclear weapons and material sites around the world. Roman students have been participating in the educational programs of the Philadelphia World Affairs Council for more than 20 years.